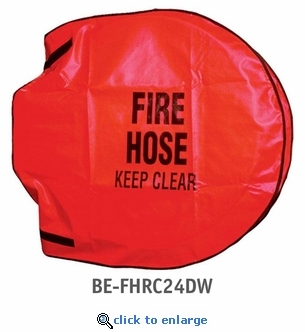 This double wide fire hose reel cover measures 26" L x 25" H x 8" W and is made of durable vinyl with hook-and-loop closures. Fire hoses that have the potential to be exposed to harsh environmental conditions need to be protected. Fire hose covers are red with contrasting black lettering to be easily identified in the event of an emergency. Fits HDR25HC hose reels from Brooks Equipment.